From Greek legend we learn of the so-called “Sword of Damocles,” a story about a member of the court of Dionysius II. The courtier, Damocles, was a typical sycophant and often remarked to the king how majestic he was, and how it must be amazing to wield such power. One day, Dionysius allowed Damocles to switch places with him for a day, in order to have the experience. The king, however, arranged for a sword to hang over Damocles’ head, held in place by the single hair of a horse’s tail. The point of course was that yes, power might have a certain magnificence and allure, but in the end, one cannot find happiness under the constant threat of destruction. “Cyber Hezbollah is an organization that was established in the summer of 2011 by supporters of the Iranian regime who operated in cyberspace against the reformist opposition during the riots of 2009. 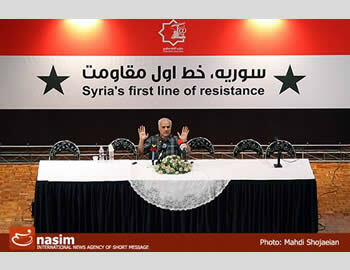 The organization’s first conference was convened in August 2011. The situation in Syria is complex, and indicative of a wider complexity with regard to how various countries and terror states in the Middle East interact. Bible prophecy students have been keen in recent weeks on the idea that Syria’s Bashar Assad, as a last, desperate act, would launch a missile attack on Israel, thus inviting a withering response that would bring Isaiah 17 into fulfillment. However, I don’t think the coming destruction of Damascus is that simple. While Syria and Egypt launched conventional wars against Israel, the regimes were sane and rational in the sense that they did not want to hasten their own destruction. In this way, the situation was akin to American-Soviet stances during the Cold War. But with the Middle East now aflame with jihad—thanks in no small part to (intentional?) blunders by Western leaders like Barack Obama—I believe the opportunities for Isaiah 17 are richer in the context of a coming Muslim Brotherhood takeover of Syria. If Bashar Assad is going to use WMD against Israel, he’d better hurry up. He is closer to ending up like Gaddafi or Mussolini than he is to attacking Israel. The Iranians have long backed Syria, used as a proxy in the terror war against Israel. Were the Brotherhood to take control in Damascus, Tehran’s ability to manipulate Israel’s northern border would be uncertain. Assad is a puppet of the Iranian mullahs and while they evidently wish to launch a nuclear attack on Israel, I don’t believe Assad is in position to make his own decisions at that level. 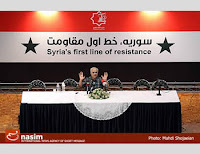 “Cyber Hezbollah’s ninth conference, held in the presence of Hamed Hassan, the Syrian ambassador to Iran, was dedicated to the current developments in Syria, with its participants expressing the Iranian regime’s continuing support for President Bashar Assad and his government. Akhtari listed several reasons why he feels the situation in Syria is different than other uprisings over the past year, and it’s clear that he wants Assad to remain in power. The Iranians, like all clans, are at odds with various other terrorist/jihadist clans in the Middle East. Akhtari feels that Al-Qaeda operatives working against the Syrian regime have done little to help Hezbollah or Syria against Israel. The Iranians feel that the Syrian situation represents a form of the Sword of Damocles doctrine, in that if the West were to act directly against Assad, a “retaliatory blow with a sword whose edges are Syria and the Islamic resistance in Palestine and Lebanon” would commence. The jihadists loathe American military might, and relish the idea that the U.S.-led West would never find contentment with the constant threat of destruction in place. In short, while all these jihadists—from the Iranian mullahs to the Wahhabists in Egypt—have the goal of Israel’s destruction, I do not feel Assad (more of a secular strongman than religious martyr) will be the triggerman. Much more likely Isaiah 17 will find its fulfillment in a Muslim Brotherhood-led Syria, which will follow its religiously motivated imperative to strike Israel.